Friends hatch a plot to retrieve a stolen kitten by posing as drug dealers for a street gang. I had heard this movie was fun, but I ended up laughing myself silly - it was even better than I expected. I did not know Keanu Reeves did the voice of Keanu. I am pleased he's continuing his tradition of completely off-the-wall cameos in off-the-wall comedies. Remember Ortiz the Dog Boy in Freaked? I haven't seen either movie, but this is supposed to be sort of an indirect send-up of John Wick, right? When I saw the trailer for this, I said, "This is going to be the best movie ever made." But the word of mouth was so bad that I didn't even bother seeing it. I guess I should? Yes, you should see it. If nothing else, it's a wonderful celebration of George Michael. I recall it has quite a few duds in there, but it never overstays its welcome. Won't exactly recommend it, but yeah, you should go ahead and watch it. Agreed. Not every swing hits the ball, but I suspect their sketch comedy background helped with the pacing - parts of it felt a bit like a string of sketches linked together in parts. This was the best random choice of movie to see in the theater my roommate and I ever made. It was the best, especially because both of us had no idea what to expect, aside from some silliness, after seeing the trailer. It was obviously a zillion different kittens... but they were all adorable! 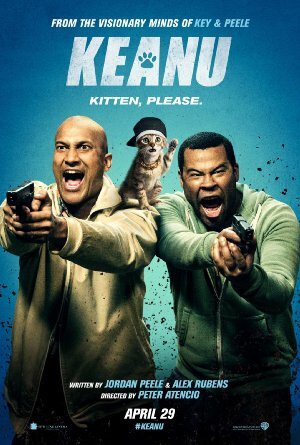 The movie is a fluffy delight, and as mentioned, highlights include an excellently-delivered George Michael gag/tribute, Keanu Reeves himself in a cameo, and a lot of the best of K&P sketches about how Black masculinity is performed. I started this movie, but to me, it had a slow opening. I got as far as visiting the drug dealer next door, does it pick up from there? Yes, it picks up pretty quickly after that! It's so dumb but very amusing. The George Michael part does indeed stick with you and come back to haunt you in weird ways when you are just sitting around thinking about work or whatever later. I recommend this as a "plane movie"-- if you can watch it for free and while you are doing something else, it is pretty good. But I really, really love Keanu, tone issues aside. Feeding Keanu motivation for his Shining homage ("She's trying to ruin your manuscript! "), the discussion of George Michael, punching out Spencer (say...! )...Aw, it's so good. If you liked their television show, you'll enjoy this movie. It's essentially a longer, more elaborate version of one of their sketches. And the George Michael thing is priceless. Finally saw this! I give it a solid okay. Heavy mining of standard Key & Peele tropes, so a nice reminder of the series, but not something that I think I’ll ever feel compelled to see again. I don't get why so many stoner movies feature extreme violence: weed makes you much less likely to shoot people, right? Anyway, I thought this movie was pretty funny. I wonder if this is the only movie around that is explicitly about AA men code switching?